With over four thousand kilometers of coastline that extends all the way up to Peru and down to the Strait of Magellan, Chile has many untouched forests, lakes, islands, volcanoes, and striking white and black sand beaches that span along Pacific coast of South America. Along the Northern part of the coast, near the Atacama Desert, is where the Humboldt current rolls in that sweeps in from Antarctica, making the waters a bit chilly for swimming, but bringing in the fresh and salty, ocean air. There is year-round sunshine, though! If you’re traveling to the middle parts of the country, you’ll encounter a milder, more Mediterranean-like climate where you can enjoy warm days under the sun and cool nights. There are secret bays and coves here, with many restaurants offering freshly caught seafood. In Southern Chile, you’ll find black volcanic sands and lush forested national parks, where you can embark on boat trips, and flamboyant lakeside excursions. You’ll encounter unforgettable cuisine ranging from seafood to beef, and have the chance to try fruits and vegetables you’ve never seen before while taking in the views of Chile’s natural wilderness and the longest coastlines in the world. 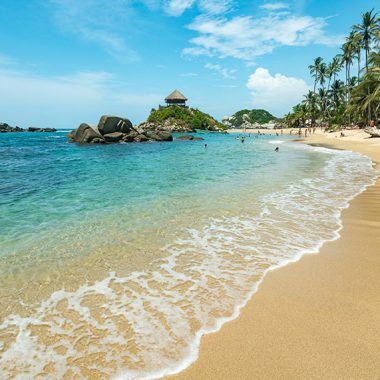 So, pack your Pablo Neruda book of love poems to read on the flight and prepare to relax on the shores of the one of the most stunning coastlines in South America. 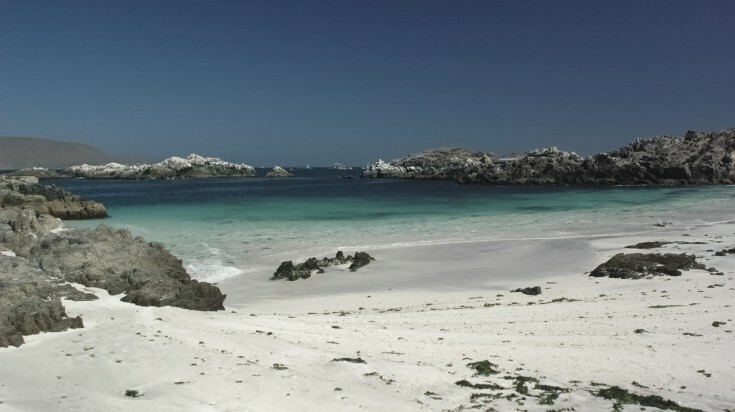 These are the best kept Chilean beach secrets. Unlike other beaches in the area, this one features darker sand than usual and lots of pebbles. Located on the coast near the medium-sized beach town of Algarrobo, the Algarrobo Beach boasts eight hundred meters of shoreline in a sheltered bay. This surfer spot has moderate waves that make it perfect for hoppin’ on your board, and also for windsurfing. From Algarrobo’s dock, you can see motorboats driving to make trips to the Pajaros Ninos Islet Nature Sanctuary, allowing you to possibly see some of the Humboldt penguins on the boats. If you work up an appetite walking alongside the waves or hunting for pretty colored seashells, there are restaurants featuring local cuisine, bars, places to buy refreshments, and shops to buy deodorant, sunscreen, or a bag of chips. If you’re feeling like learning some history and seeing beautiful architecture, the Church of La Candelaria (also a national monument) was constructed in 1837 by the Parish priest Manuel Beltran. In the corridors, Santa Teresa de Los Andes would come and teach catechism to the youth. In the warmer months, there are sunbeds and umbrellas available to rent during the day. If you’re here during the Summer and looking for evening entertainment, check out the Casa de la Cultura (House of Culture) for presentations of chamber theatre. There are three different festivals held at this best beach of Chile. One of which is the Algarrobo Rock Festival, where rock music fans are likely to have a fun time and another one is Oktoberfest- bet you can guess what kind of alcoholic drink is served at this one! The Noche de San Juan festival features many vendors with sardines to snack on and live music to dance to. 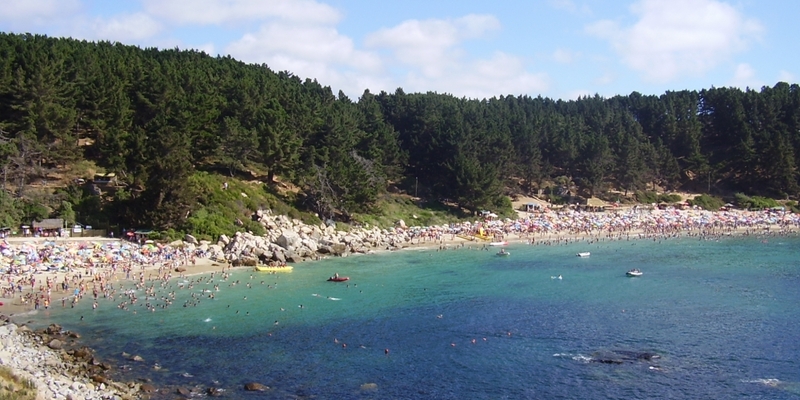 If you’re looking for beaches near Santiago, Algarrobo Beach is located a quick two hours via bus from the city. One of the best beaches in Valparaíso, Playa Las Torpederas is centered at the foot of colorful houses and hills, with steep cliffs surrounding it. If you’re wondering how this port city beach’s name came about- In 1887, a torpedo boat base was established here, where two torpedo boats were stationed out on the waters of Valparaíso Bay, and two were stored in a shed ready to be used at any moment until 1895. For those of you looking for a peaceful and not-so-touristy beach, some say Playa Las Torpederas is a bit of a “lonely” beach, as you won’t often see this brimming with people. You can rest assured that you can visit with your friends in peace while basking in the lulling sounds of the waves. It’s classic to see entire families enjoying meals together at tables that are spread out here on this beach. For those that live in nearby Playa Ancha, Las Torpederas is a treasured recreational spot, and it’s prized for a wonderful sunset swim. If you’re looking for a daytime outing, in the city of Valparaíso, you might choose to enjoy a rich cup of coffee while people-watching, walk around and admire the artwork and murals on the streets, and if you want to blow a couple of bucks, you’ll find flea markets with second-hand items for sale. Public transit is always available if you want an alternative to walking! Nestled North of Viña del Mar, Concon Beach, is a Chilean beach known for its towering sand dunes between the road and the water. If you are willing to take on the challenge of climbing one of them, a spectacular view awaits you at the top. If you’re looking for beaches near Santiago, this is a great option. Santiago isn’t on the coast, so you’ll have to travel out of the city to get some beach action! As Chile beach towns go, this town is fairly large sized, painted in vivid colors, and is typically abuzz with people and activity. If you want to sandboard, there are some available to rent- just be prepared to fall at least a few times if it’s your first time! Just wear clothing that’s not skin-tight, as you’ll want to be able to brush away any sand that might stick to you. If you’re traveling from Valparaíso or the Vina del Mar beach, Chile, there are multiple microbuses that commute every day to Concon. If you are arriving during the busy months of January and February, expect the journey from Valparaíso to Concon to take anywhere between an hour and a half to two hours, as opposed to a much quicker traveling time at any other point in the year. It’s worth the trip though, because this is one of the best beach towns in Chile that shouldn’t be missed! North of Santiago and between the cities of Antofagasta and La Serena, a little over one thousand kilometers away lie the picture-perfect transparent, turquoise waters and fine white sands of Bahía Inglesa Beach. Upon arrival, you’ll immediately see glimpses of large rocks on which you can climb up onto and sun soak for the day. If you’re arriving in Santiago, a flight will get you to Bahía Inglesa in a little over an hour. Remember to rub on some sunscreen or wear a hat if you’re going to be out in the sun for a while. If windsurfing appeals to you, lessons are offered here as well as equipment for rent. Diving is also an activity you could do for the day- the ocean floors here are teeming with marine life. If you’re interested in doing a trip to a nearby town, consider Caldera- the antiquated Casa Tornini building that’s full of ancient Chilean artifacts. There is also a zoo called (Zoológigo de Piedra) in Caldera that is not what you would think- it’s actually a zoo of animal-like designs that have been carved into the stone from the fierce winds that have barreled through and shaped the rocks over time. 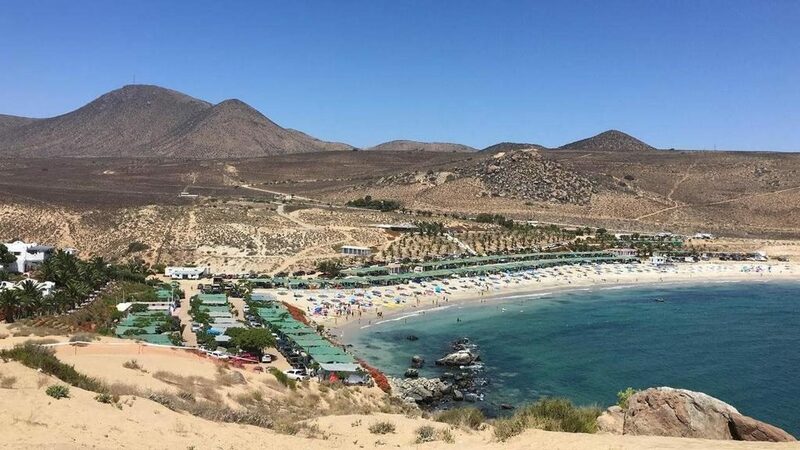 Close to La Serena, Playa Blanca is within the city limits of Coquimbo and glistens with white sand as far as the eye can see. This Chilean beach is known for its sand dune at the Northern end, and kids gawk at the chance to climb up onto it so they can have a bird’s eye view of the entire beach. Many beachgoers are fans of engaging in any aquatic sport here, for the waters are unperturbed. If you’d like to pitch a tent for a night or multiple nights, camping is an intrepid option. Amenities such as running water, light, bathrooms, and even places to wash your clothes are available. The campsites also come with a picnic table that fits six people at a time, some of which are located underneath nice shade trees. A big trash can is also present to encourage visitors to keep the beach clean. There is a nearby minimarket with anything you would possibly need, whether it be a pack of gum or an ice cold water bottle. Next door, you’ll find a restaurant with delicious french fries and fried empanadas that is open for business, should you work up an appetite after having a ball at the beach. 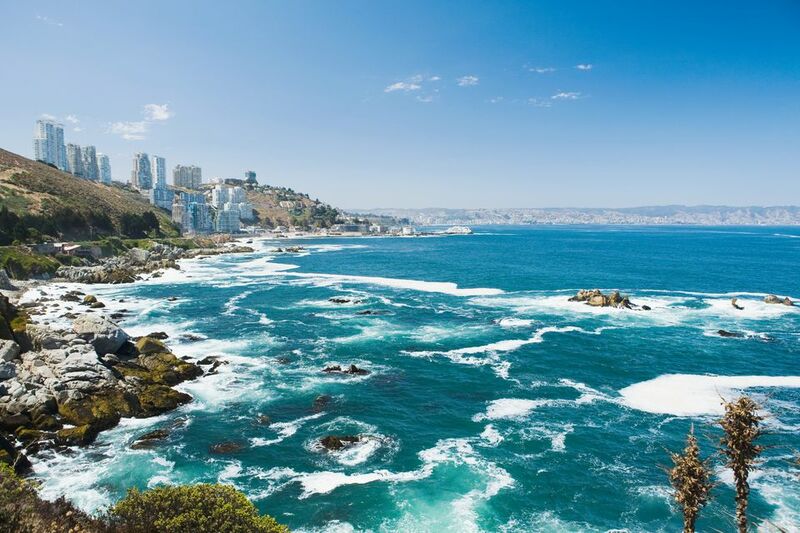 As one of the most popular beaches in Chile for locals and tourists, Viña del Mar is a two-mile stretch of beach that snakes along the Chile coastline with a bike path that runs parallel to it. One of the Chile beach resorts that’s designed for a family, Playa del Sol has exceptional owners, and boasts a pool area, gym, washer, and dryer, is very close to the beach, but far enough away from the hustle and bustle of downtown (about ten minutes). It’s truly a home away from home. It’s also located near wineries if you want to try some infamous Chilean wines. If you enjoy the finer things in life, there are many high-class restaurants that are located in Viña del Mar that feature seafood dishes in addition to various shopping locales, inclusive of trendy boutiques and shops, as well as beachside bars where you can enjoy a glass of vino tinto, otherwise known as red wine, under the beautiful sunset. The water, however, is a bit nippy to swim in, but the beach is still worth the visit. 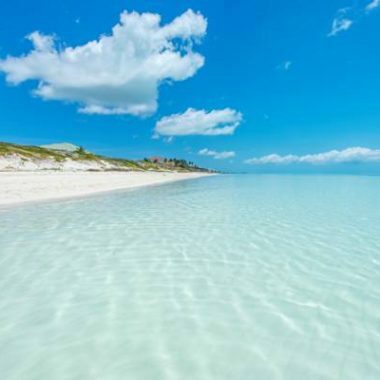 There are long stretches of sandy, clean beaches in which to sprawl your towel out on, and are perfect for reading a book and listening to the waves. You can practice yoga, go for an endorphin-releasing run, or engage in nearly any sport you could imagine. During the Summer months, you’re likely to see many beachgoers here that give the town that “liveliness” factor. Do pay close attention to the waves, as the riptides can surface quickly and unexpectedly, and there are not typically lifeguards on duty. This being one of the best beaches of Chile, La Herradura Beach’s waters are crystal clear, warm, and as gentle as can be. You’ll seemingly never run out of beach, as the port city of Coquimbo itself boasts over fifty-six kilometers of it. For those of you readers that like to skateboard, there is a skateboarding park to the right of the beach. Volleyball also awaits you, as does the fine white sand of this beach between your barefoot toes! There are also a plethora of aquatic activities you can participate in including water polo, water-skiing, windsurfing, surfing, and swimming. If you don’t feel like doing anything and just want to “bathe” in the water, it’s generally the perfect temperature to do so. For dessert, try one of the delicious churros or natural fruit ice creams that are sold on the streets. Accommodations range from camping, five-star hotels, to homely cabins. After settling into your new room for the night, try your luck at a local restaurant that features regional cooking- there are a few in which you are able to have a seat with a view of the entire bay. If you want to venture out on a day trip into the city of Coquimbo, you’ll see the British influence in the architecture, the remaining old pubs, casinos located in old buildings, and nineteenth-century two-story homes. Perhaps you can make a pit stop at the fishermen’s market to try some fresh ceviche, or the churrasco marino (fried fish in a bun). Nudged between the Pacific Ocean and the Atacama Desert, and about twenty kilometers South of the border between Peru and Chile, is the subtropical Arica – a beach unlike any other. Located near one of the driest cities on the globe, it has only rained three times here in the last century, making it one of the most unique places on the Chilean coast. It’s just a half hour away from two of Chile’s airports for those who don’t want to have to travel much to far after disembarking. If you’re contemplating bringing the family here for a mellow vacation, this place is not too touristy. In fact, the Arica beach is nestled within a national park, and the protected status keeps the crowds away. Surfers are fans of this sandy beach and its warmer waters, as well as of the warm weather every day of the year. The cost of living here is some of the lowest in the country, too! If you want to brush up on some history, visit the neighboring city of Azapa Valley, where you can visit the museum that displays some of the oldest mummies in the world. In the downtown area of Azapa Valley, you’ll see many palm trees and hear peaceful trickling water fountains. For more historical outing options, you can tour the geoglyphs that can be seen in the nearby Lluta Valley. Failing that, a stroll through the Parque Nacional Lauca (the Lauca national park) is definitely worth your time. 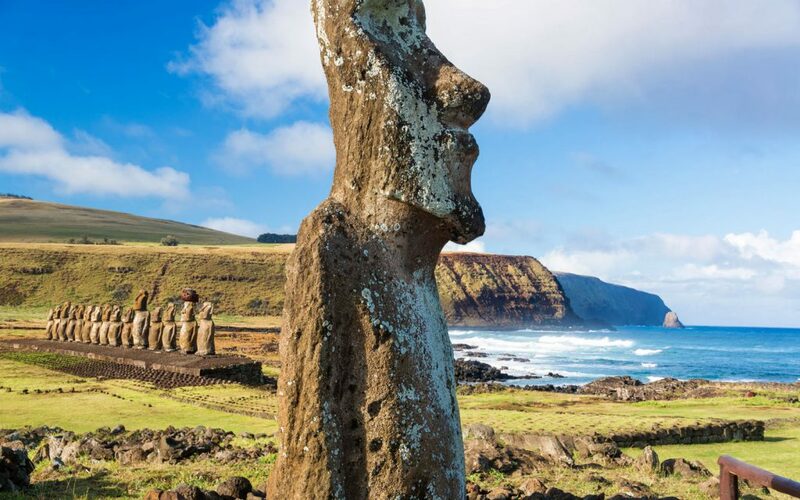 Imagine an afternoon at the beach on a Chilean Pacific island, combined with giant carved stone figurehead artifacts, practically next to you. 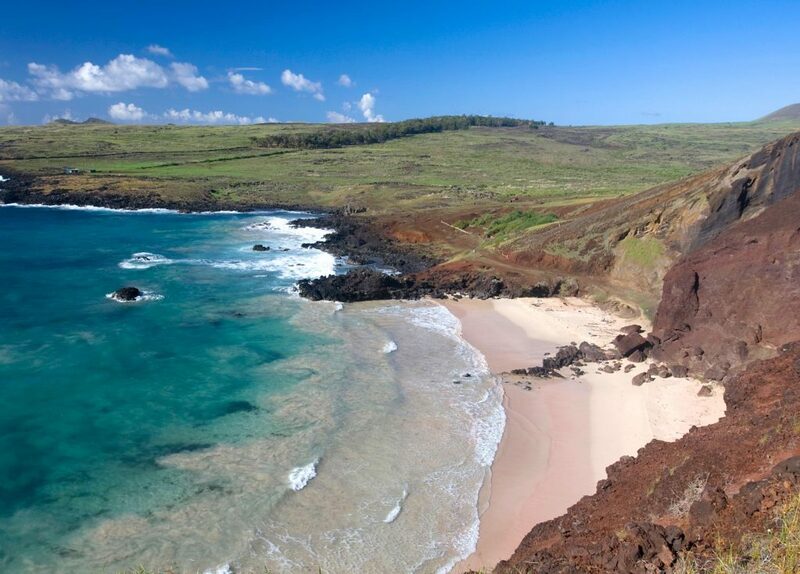 Anakena Beach is the main beach on Easter Island, where white coral sand and palm trees abound. This significance of the name “Anakena” is believed to refer to the caves of the island that the masked booby, a native bird, nests in. 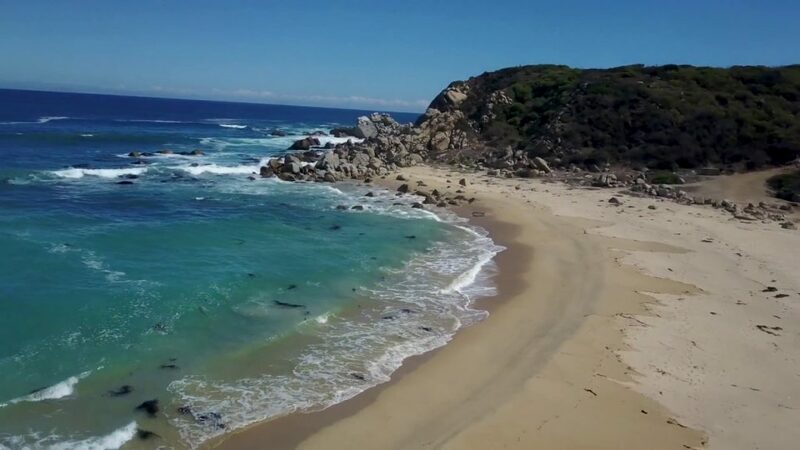 While swimming in this untouched beach, you’re likely to see multi-colored fish through the surface of the water, going about their daily business and darting all about. The waves are very serene, so they aren’t hard to miss. And, if you like to scuba dive, you surely won’t be disappointed. If you’re interested in photographing the attractive scenery, the lighting of the morning hours is best. For you cyclers, there are paths to bike all around the island, and it’s a quick way to get around without having to rely on anyone else. An added bonus is that you can burn off all of that food you might be gorging out on while on your vacation. As one of the greatest Chilean beaches, the beach has many picnic spots that are shaded under palm trees. There are also walking-distance kiosks that sell tuna and cheese patties, fresh seafood platters, and local Mahina beer to pair with it if that sounds yummy to you. In front of the beach, you’ll find a recently created campsite called Ana Tekena, where you can stargaze and breathe in the fresh night air from your tent. 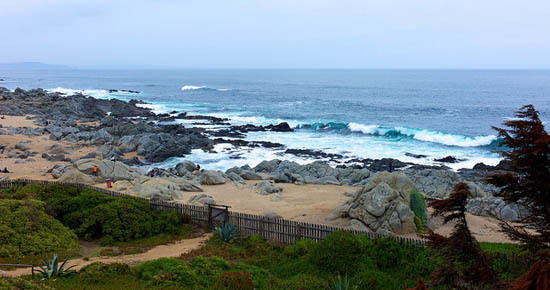 Isla Negra, one of the top spots near Santiago, is abundant with sea pine trees and jaggedy, large rocks, and is situated just a few hours South of Valparaíso, Chile. And nope, it’s not an actual island, like you might be led to believe. You can see the famous Chilean poet, Pablo Neruda’s largest and most immaculate house that’s built in the shape of a boat, as he was very much intrigued by all things relating to the sea. Feel free to also visit the museum in town that is dedicated to his life. If you want to make sure you can get your hands on some freshly made seaside empanadas, wake up early enough to go in the morning. There are also many artisanal items for sale by hippies on the beach. Many artisans, artists, and writers live in this Santiago. If you’re feeling crafty yourself, there are many craft shops to purchase materials. There are many hotels and hostels in Isla Negra, in addition to authentic diners featuring Chilean mariscos and typical dishes such as chapelele (potato bread with flour). 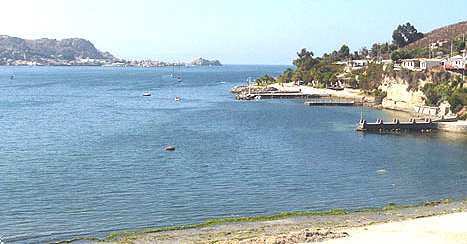 Isla Negra is only two hours away from Santiago. If you’re coming to Isla Negra from Santiago, buses leave from the Pajaritos and Alameda bus terminals, both of which you can find on the Metro Linea 1, also known as the “red line.” If you need to return back to Santiago, you can hop on a bus that goes straight back to the city on the main street. However, if you need more beach action, the Vina del Mar beach north of Valparaíso is worth a visit if you’re in the region. What type of clothes should I bring with me? Light and comfortable clothes that you might not care about getting dirty are ideal to wear to the beach if you have a jam-packed day of activities. It’s normally suggested to bring a T-shirt and long pants, in case the wind picks up in the afternoon. If you do take a break from the beach to dine out, the Chileans do take pride in the way they dress while out in public. So, maybe wear at least a sarong to cover up your swimsuit, or something else that’s presentable. Do I need any immunizations to enter Chile? There are no mandatory vaccinations needed in order to be allowed to enter the country. However, if you do decide to travel to Easter Island, a yellow fever vaccine is required. Some travelers like to refresh their tetanus shot before leaving on their travels as a precautionary measure. Just be conscious of what you touch and how often you wash your hands when traveling. How does Chilean currency work? The unit of currency is the peso- in denominations of one, five, ten, fifty, one hundred, and five hundred pesos. Most banks are open from nine in the morning until two in the afternoon. If for any reason you have a delay in exchanging your currency, most large hotels and restaurants accept Mastercard. For those of you planning on traveling out in the boonies, bring extra change and cash with you. Is Chile a safe country? Chile is, for the most part, a very safe country- even for solo female travelers. If you can take the occasional compliment and not be offended by it, you’ll do just fine. In large cities, such as Santiago, always stay on the lookout for anything suspicious, and think about storing important documents like your passport or extra credit cards in the hotel room. How is the weather in Chile? In the North of Chile, you’ll encounter hot temperatures, with little to no humidity. In the very Southern point of Chile, near the breathtaking Torres del Paine for example, no matter the season the weather is cool. The climate of the central parts of the country is similar to the Mediterranean or California wine country weather, with long dry summers, and rains that arrive in may, that last until August. The Summer months in Chile are December, January, and February. Where can I go scuba diving in Chile? While there are plenty of excellent places for scuba diving, Chile has one destination that is a cut above the rest: Anakena Beach on Easter Island. Featuring crystal clear waters and an abundance of sealife, it’s a must-visit destination for divers. How many days can I stay in the country upon arrival? You’ll be issued a ninety-day tourist visa when you land. You can always ask immigration about extending this if need be, and a small fee will be assessed. Will I be able to drink tap water? Most locals and foreigners alike have no problems with the tap water. However, it does have a high mineral content and might upset your digestive system if you are not accustomed to it. Water bottles are always a great bet if you have any concerns, or opt to bring your own water filter to save on plastic waste. If I’m planning on hiking in Patagonia, what kind of footwear should I bring? It’s a good bet to bring hiking boots or shoes with you that provide adequate ankle support, that isn’t too bulky and heavy. A change of shoes is ideal to bring if you plan on transitioning into a different activity later in the day, too. You probably wouldn’t be too keen on having to wear your hiking boots at the beach because you forgot a backup pair of shoes. Do I need an electrical converter to charge my electrical devices? Yes, you will need an adapter to charge your devices. Chile’s plugs are two-pronged, wide set, and round-pronged. If you can get around having to charge anything and just bring a backup set of batteries, that works, too. It’s up to you as to what best suits your needs. What time zone is Chile in? Chile is four hours behind GMT (Greenwich Mean Time) the majority of the year, and the country does not observe the “normal” Daylight Savings Time. From the middle of December to mid-March, Chile abides by its own Daylight Savings Time, which is three hours behind GMT. If you’re traveling to Easter Island, the local time is two hours behind that of Santiago.